I never need an excuse to sit down and binge watch TV, but researching with a critical eye to evaluate the craft behind the characters, structure, and plots meant I really needed to pay attention. The obvious place to start was with some of the most relevant more famous sitcoms such as Fawlty Towers, 2.4 Children and Allo Allo, but I felt I knew them well enough to take a different path and explore some new contemporary series. After all, TV is watched in a very different way now. My first stop was the IMDB Top 10 TV Series, to see what was popular. The list was dominated by cinematic big budget dramas and thrillers like Taboo, Games of Thrones and Fortitude. I scrolled down the list into the twenties 20’s and beyond for lighter dramas with a comedic tone. Girls, was my first pick. At 30-minutes per episode, it adopted the typical sitcom structure. 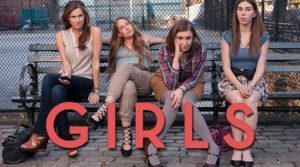 Rumoured to be off the wall and quirky it had thrown Nicola Zangara (Huffington Post blog – May 2015 – 4 Reasons Why I’m Not Watching the HBO Show Girls This Season) into a spin. She maintained that she couldn’t watch the series as she didn’t warm to the characters and the episodes were random and weird, not familiar or consistent. Lena Dunham had definitely challenged the norm of the genre. Nicola Zangara was right, the first series was all over the place and the uncomfortable sensation in the pilot lasted most of the first series, but it had something. The subsequent series was much better and the unexpected became expected. Needless to say, I have now binge-watched all 6 series. The sexual content of the series proved that there aren’t many boundaries anymore. This justified my binge-watching the most, as our a mainly adult clientele coupled with the mix of sun and alcohol, had generated some interesting content material that was beyond spicy. Next up was, Sensitive skin, a Hugo Blick directed series which has been readapted for a US audience from the original UK series (2010) starring Joanna Lumley. This was a really useful contemporary TV series (2015) to study. Its strong female character who often doubts herself creates an undercurrent of middle age insecurity. Al, her neurotic husband, who seriously doubts his abilities but with the inbred humour of Woody Allen, constantly addresses his internal fear of failure, not that dissimilar to the male protagonist in Seasons. Both lead characters were great reference material. I now needed to address a modern take on living in a foreign country. The Good Karma Hospital (ITV) and 30 Degrees in February (hosted by Netflix in the US and Sky in the UK) were my next visual feasts. The Good Karma Hospital pulled in 8.1million viewers for its last episode of the series and ITV subsequently commissioned a second series. It was light-hearted and definitely highlighted the expat insight into living abroad, but it had no real guts and the characters were shallow. 30 Degrees in February, a Swedish series which follows a motley collection of escapees looking for happiness in Thailand, is a 60 min 2 season drama. It won the Kristallen Awards for Best TV- Drama 2012 and is darker than most of the series I had watched so far. Some sensitivities were lost in the language and the familiarity with Swedish culture, but the individual storylines of the characters were very evident and intriguing. The challenges of living in Thailand, difficulty with the language, the need for licences and the harsh police system also related closely to our experiences in France.